The Boy's Dolfin Zephyr Jammer is the ideal training swim jammer for your son! It has a cool looking purple and white print and is made with longevity in mind. The boy's black Dolfin Zephyr jammer's will make him love his visits to the pool due to it's fashionable print and comfortable fit, it is made from Dolfins Reliance™ fabric which is a blend of PBT and Polyester to give excellent chlorine resistance and will last for 100s of hours of intensive swim training! The Boys Zephyr Jammers comes in a cool purple printing and is made from Dolfin Reliance™ fabric which provides excellent longevity allowing your swim jammers to last for 100s of hours of swim training making it ideal for regular swim training! This stylish Jammer is part of the Dolfin Reliance range of boy's swimwear. Dolfin Swimwear are popular among swimmers because of their excellent lifespan, comfortable fit and bright, colourful designs with inside lining. 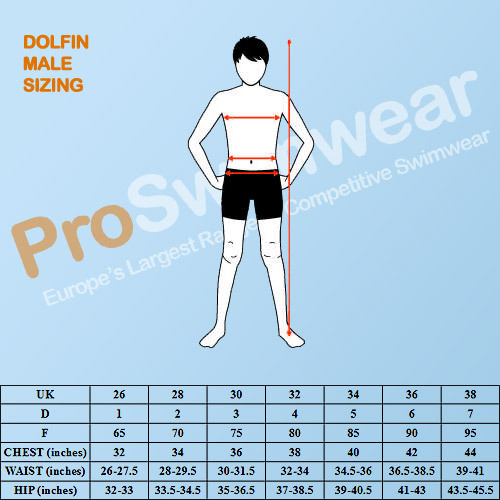 Dolfin Reliance boy's swimsuits are quickly becoming a popular training suit for a lot of swimmers, especially those in swim clubs, as you can get matching Jammers and Swimsuits to suit your swim clubs colours! Boy's swimsuit from the popular Dolfin Reliance collection.